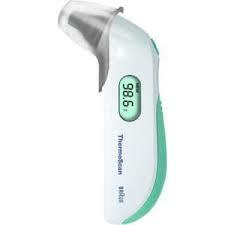 Braun Thermoscan Ear Thermometer with 1-second readout. Professional Accuracy. The fact that it can provide accurate readings in just one second makes this thermometer very useful, especially when parents have troubles with their kids whenever it is temperature-taking time. With this thermometer you don’t have to worry that you won’t get accurate results. Moreover, the product is designed to beep at the end of a reading so that you know when it is safe to remove the thermometer from the ear. In case of need, the thermometer also features a temperature recall, so you can re-check the reading. As far as the design is concerned, this thermometer is ergonomically designed for an easy manipulation. Its tip is soft and flexible and it is equipped with a filter detector. The thermometer comes with 21 lens filters that you can change every time you consider necessary, so that the thermometer remains hygienic at anytime, for every usage. This item has low energy consumption. It comes with an AA battery which lasts for approximately 10,000 temperature readings. This means that you don’t have to carry with you batteries, for the thermometer will function for a long period of time. →The Braun Thermoscan Ear Thermometer with 1-second readout, IRT3020US is a great ear thermometer that gives parents the chance to measure their babies’ temperature quickly and easy. →Its features and ergonomically design makes the product efficient and practical, fitting smoothly the needs of parents and even adult use.